Thank you for spending some of your time catching up with me today! Today’s episode contains knitting FOs, knitting WiPs, an in-progress cross stitch project, an audio podcast recommendation, and some Lamby shop news! ▲ Dr. Death – This story is… wild. ▲ There will be a bag upload in the shop on Wednesday, October 10, 2018 at 7pm Eastern US time. It’s time once again to look at my 2018 Stashdown progress; where has this year gone?! Let’s start with my yarn stash. My green streak has finally been broken: I bought some yarn for a sweater this quarter that I was not able to knit out of stash (plus during Tour de Fleece, while I did not spin a ton, I did spin in a fair amount of yardage). I did knit quite a bit over the summer, but I didn’t finish quite as many projects as I would have needed to in order to negate it. It happens. July and August were slow months, and September’s finishes were fairly small. So whatever; I am fine with that number for the quarter. 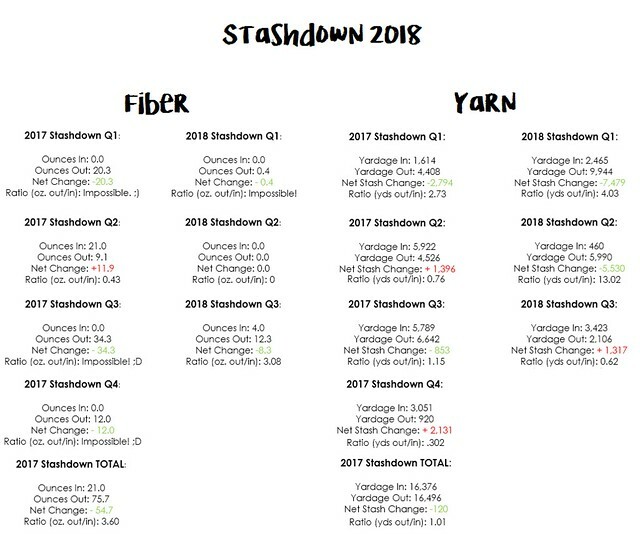 As long as Q4 is stash neutral or even a little green, I will have had an amazing year for using up and rehoming extra yarn. It would take quite a bit of effort to not beat 2017’s -120 yards of stash. My fiber stash numbers are still OK. I did spin out 3 braids during TdF, but I also rejoined the Hello Yarn fiber club (Have you seen the new club structure? The first entire year is birds! ), so I will have a little bit of fiber coming in every month that I need to push back against. When I am spinning, I love to spin, but if I am not careful I can get consumed by it and not do other crafts. I hope as the weather cools a bit I can dedicate the time to spin at least a few hours a week. I miss being in the habit. And if I’m not careful, that one braid per month is going to seem like it multiplies. So all in all, not a bad quarter! I am looking forward to seeing what I manage to work on in Q4.